Margherita Tortora is Senior Lecturer of Spanish and Latin American studies at Yale, and founder/executive director of The Latino and Iberian Film Festival at Yale. She’s been instrumental in bringing Latin America cinema to Yale, New Haven and the greater New England region. I spoke with her on February 27, after presenting “Return to the Andes” the evening before to faculty, students and the general public on campus. How did you get interested in film and organizing a film festival? I’ve been a lifelong cinephile. My family is Italian — my uncle’s hometown in Abruzzi is where they used to make “Spaghetti Westerns” like the Good, the Bad and the Ugly! I took some film courses while attending Smith College. A few years later, while I was teaching at Berkeley, some friends and I started a cine club, meeting at each others’ homes. 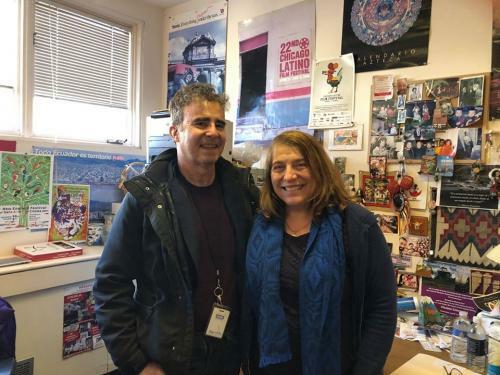 At Yale, I got the idea of starting a film festival from the Chicago Latino film festival and my friend Pepe Vargas, who’s been doing that for over 30 years. I was always fascinated by how so many people in the greater Chicago area would come out for a festival that lasted over 2 weeks, and how they got major cinemas to support it. I was already teaching a Spanish through Film class, had met and stayed in touch with many of the filmmakers. I remember feeling kind of selfish, having this wonderful time and not sharing it with the greater New Haven Community!